Normally we avoid "modern" Pooh, preferring the classic Many Adventures of Winnie the Pooh . 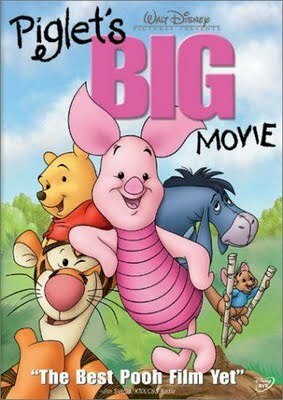 I saw The Tigger Movie when it first came out (and wasn't very impressed) but thought we'd take a gamble on Piglet's Big Movie on a day when we needed a little entertaining around here. Delightfully, we were very pleased with the film in general. We watched this some time back (right after reading some Winnie the Pooh stories) but then watched it again last week and I thought I'd give it a mention. Piglet's Big Movie does open up with a scene not in the books and there is a soundtrack with songs that play over certain scenes in the movie which are not so very traditional. But the animation sticks close to Disney's original Pooh film which I definitely appreciate. In this movie, it opens up with a scene which includes Rabbit, Pooh, Tigger and Eeyore working at one of Pooh's schemes to obtain honey from the bees. Piglet approaches the gang but they think he is too small to be of much help or use to them in their project. The opening scene definitely shares the message that "Little people are important too!" Seeing that I don't have any objections to this on its face (and it's presented in a subtle way) it didn't bother me. The friends realize though that Piglet is a small and useful creature that they care about. However, by the time they notice he is missing from their company, they can't find him. They do, however, find a scrapbook that Piglet made which contains pictures of various activities that the Hundred Acre Wood gang have done all together. They decide to use the "scrapbook full of memories" to find Piglet and so begins an adventure full of flashbacks to good times in the Woods. The time Kanga and Roo moved to the Hundred Acre Wood and the animals all thought that Kanga was a fierce animal. We follow Rabbit and friends as they plot to get rid of Kanga and Roo by having Piglet switch places with Roo. Of course, in the end, they discover that Kanga and Roo are friendly companions and they are glad to have them. "Ah-HA!" I think on the whole, this movie is true to Milne's stories and it helps to familiarize the younger generation with these delightful tales of life in the Hundred Acre Wood. Yes, a few liberties are taken but I can live with the liberties if they hold true to the spirit of the books - which I think Piglet's Big Movie does. I'm so glad that my little ones love Pooh! The innocence and fun in the Hundred Acre Woods is a delight. I like the characters, the stories and the way that Disney brought Pooh and friends to life. I'm sure we'll be enjoying Pooh for a few years yet and I couldn't be happier about that! We watched the original movie last week, and E kept requesting it. He was on my lap when I started reading your post...so we had to watch the trailer. I have the book...maybe this summer we will read it and actually go to the theater as a reward when we're done. Never did that before. I have always loved Winnie-the-Pooh and decorated my son's nursery with a Pooh theme. He was about 2yo when Tigger's Big Adventure came out on VHS and we only watched it once. It made my son sad and he cried because Tigger was all alone and couldn't find any other Tiggers. Piglet's Big Adventure sounds a lot better! My boys were all Pooh fans when they were younger. It made me so sad when they didn't want to read or watch about him any more! There was a weekly cartoon version of Pooh hen, and we have a few tapes from that as well as the four classics. I hadn't heard of these new ones, but I am glad a new generation will be introduced to the gentle world of Pooh. This sounds really cute. Always good to have a title I know is a good one for the day when we need to veg before the screen! Of all our movies Pooh is still a favorite. I'm glad! I like his innocence and how the friends always work together to solve their problems and conflicts.